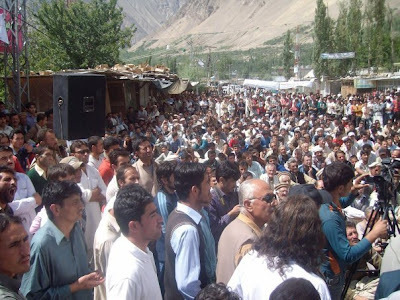 People of Hunza-Nagar observed complete strike and held a big rally at Aliabad here on Thursday for acceptance of their demand of another seat for Hunza in the Gilgit-Baltistan Legislative Assembly. Civic and business life came to a grinding halt and transport remained off the road throughout Hunza, Nagar and Gojal. Thousands of protesters blocked Karakorum Highway (KKH) for about eight hours. The call for the shutter-down and wheel jam strike was given by the All-Parties Hunza Action Committee formed recently to spearhead the struggle for two seats in the legislative assembly. Hunza, with a population of over 61,000 and an area of 10,100 square kilometres is the largest constituency in Gilgit-Baltistan which has one seat in the legislative assembly. Addressing the rally, leaders of the political parties highlighted the geo-strategic importance of Hunza and said that the valley which is known for its beauty and considered the popular tourist destination in the world is the gateway to China and Central Asian states. The government is earning billions of rupees as revenue from this area. The people of Hunza have played a leading role in the liberation war of Gilgit-Baltistan and other wars but successive governments have failed to acknowledge their sacrifices, and deprived the people of their basic rights, they said. They said Hunza was given a single seat in the Advisory Council in 1974 after abolishing the princely state by Zulfikar Ali Bhutto while some tehsils in Gilgit-Baltistan with less than 30,000 population had been given two seats. They also condemned Gen Ziaul Haq for abolishing the Additional District status which was given in 1974 by Zulfikar Ali Bhutto. Ghulam Muhammad, senior leader of Pakistan People’s Party Gilgit-Baltistan expressed his confidence on the youth for their struggle. He, however, came down heavily on chief Executive and other elected representatives of Hunza for failing to resolve the longstanding issue of additional seat. Atiqa Ghazanfar, member NALA urged Prime Minister Yousuf Raza Gilani to visit Hunza to take stock of the grievances of the people. Chief of Labour Party Boloristan Advocate Ehsan Ali said that all successive governments have ignored and done injustices to the people of Hunza. He said the share of people of Hunza in government departments and local administration is negligible. He said the youth were now united to fight against all injustices and violation of merit. Mir Baz, another senior PPP leader, criticised the ruling elite of Hunza for their apathy towards the problems of the people and urged the people not to vote for those candidates and leaders who are responsible for this situation and elect educated and young leadership in the legislative assembly. Sultan Madad of Boloristan Research Forum said the rulers have deprived the people of Gilgit-Baltistan of their democratic and constitutional rights. Sheikh Abid urged the people to continue their struggle for the cause and said that the action committee would make future strategy to continue protests till the demand is met. Sheikh Musa Karimi said that Hunza is a model educated and peaceful society thanks to the efforts of civil society organisations but the government has always discriminated against the region. He condemned the assertions of Kashmiri leaders over the Gilgit-Baltistan. Baba Jan, chief organiser of Progressive Youth Front warned of the government of the consequences if the demand of the people of Hunza was not met.Fida Karim, president of Hunza chapter of PPP, assured all out support to the action committee in their just struggle for the rights of the people. He said PPP would not compromise on principles and will also opt for the election boycott. Noor Muhammad, general secretary of the action committee, said that the people of Hunza were facing discriminations in public sector jobs and projects.Karim Sher, Former District Councillor condemned the role of some leaders of Pakistan Muslim League-N and Jamiat Ulema Islam-F for creating hurdles in creation of six new seats in legislative assembly.Ali Qurban, Iman Shah, Haider Tai, Sher Khan, Ghulam Murtaza, Ikram Najmi, Irfan Karim and others also spoke the rally. In the end, the participants marched from College Chowk to Aliabad Police Station and chanted slogan against the government and local administration for discrimination.